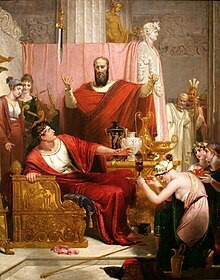 The Sword of Damocles is hanging over the world economy, held only by a single hair of a horse’s tail. With such visible danger, the problem could have been fixed easily by either using a gold chain or even removing the sword altogether. But the elite, and central bankers have had other plans. Instead of replacing the hair with a solid metal chain, the sword is today hanging by a very fragile thread that can break at any time. The global financial system was on the verge of collapse a decade ago. 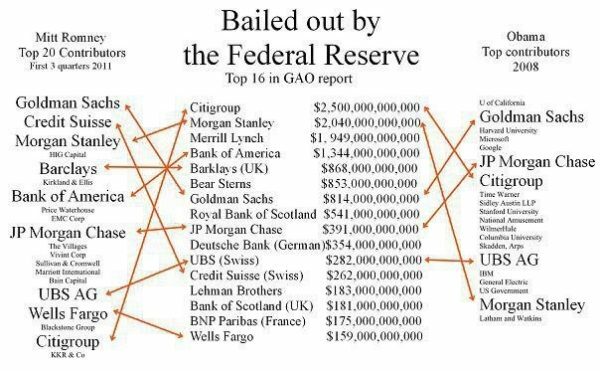 Central banks around the world, led by the Fed injected around $25 trillion in loans and guarantees. Banks like Citigroup, Morgan Stanley, Merrill Lynch and Bank of America got trillions. (see table below). Today, more than ten years since the Great Financial Crisis started, the debt problem has become uncontrollable. Global debt has doubled since 2006 and together with derivatives and unfunded liabilities risk has grown exponentially. So $100s of trillions increase in debt and liabilities has not bought the world enduring stability but instead weakened the foundations on which the world economy rests to an extent that the next rescue attempt will totally fail. It is therefore inevitable that the Sword of Damocles will soon drop and cause irreparable damage to the world. We can speculate if central bankers are totally unaware of the risks or if they have a hidden agenda. There are theories that the elite will orchestrate a collapse of the dollar and of the financial system which will cause global panic. The purpose would be to hand over political and economic power to a centralised authority with the BIS (Bank of International Settlement) and the IMF playing a central role. Social unrest and migration is all part of the plan. The ultimate goal would be a NWO (New World Order) government and currency. Microchipping everyone and eliminating private property would be also be part of the plan. Whether this is all conspiracy theory or if a clandestine plan of this nature actually exists, time will tell. For most people it all seems very farfetched and unlikely. What seems more certain is that when the current economic super bubble bursts there will be dramatic changes in the world economy and in the political system. If governments and central banks lose control over both the financial system and the political system then the vacuum created could be extremely dangerous. If law and order cannot be maintained, then the whole fabric of society will disintegrate. That would also involve the breakup of national borders as well as mass migration on a much bigger scale than we have seen so far. Whatever the exact course of events, the world will experience major changes starting in the next few years. By mid-century our children and grandchildren will live in a very different world to the one that the West has experienced since WWII. Humanity has always adapted throughout history and most certainly will this time too. But there is likely to be a lot of suffering and hardship for a major part of the global population. The explosion in the world population from 1 billion to 7.5 billion since 1850 is likely to reverse. This will lead to a reduction of maybe 2-3 billion people due to war, civil unrest disease, famine and lack of nutrition. All forecasts are by definition wrong so only future historians will get the facts right. What is going to happen in the shorter term is easier to forecast with greater accuracy. When the Sword of Damocles falls within the next 1-3 years, the damage inflicted to the financial system will be of such magnitude that central banks desperately will print $100s of trillions or quadrillions to save the system. But this time the printed money will have no effect. Instead it will destroy the value of money and create the biggest global hyperinflationary period in history. Major trends normally start in the periphery before they move into the centre. There is no better measure of hyperinflation than gold. Because gold reveals the mismanagement of the economy and the debasement of the currency that has been rampant in most countries in the last 100 years. 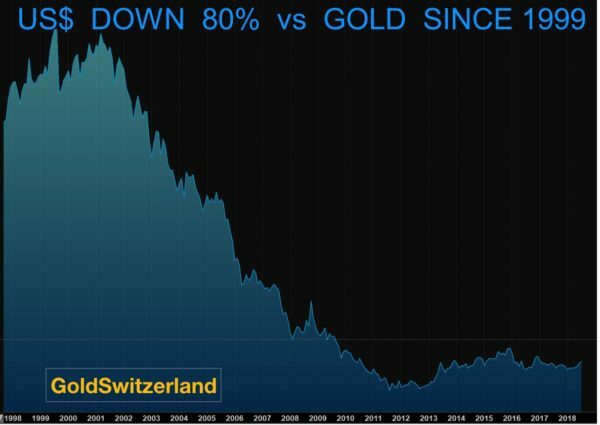 If we just take the dollar, it has declined 97% against gold since 1970 and 80% since 1999. But that decline is nothing compared to the countries that are already encountering hyperinflation. 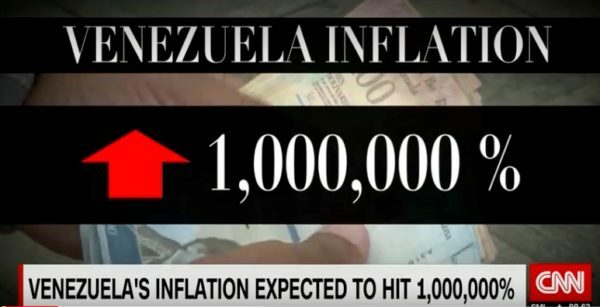 By the end of this year, inflation in Venezuela is expected to reach 1 million percent!! At that rate, Venezuela is now in the Weimar stratosphere. 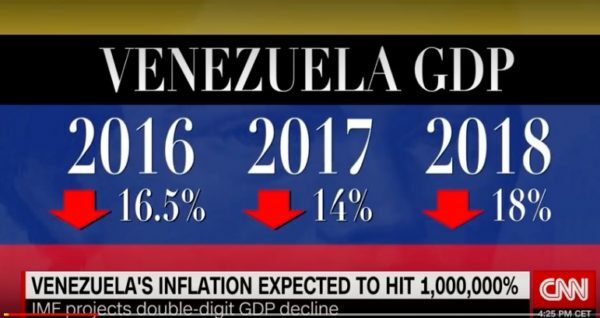 In January this year the IMF estimated that Venezuelan inflation would be 2,400% in 2018. Only the IMF can make such an incredible mistake in forecasting 2,400% when the actual will be 1 MILLION percent. What this also shows is that when hyperinflation takes hold it increases stratospherically. A cup of coffee cost 2,300 Bolivar a year ago and is now 2 million Bolivar. From August they will take five zeros off the currency. We will see how long it will be before hyperinflation adds them back again. As Margret Thatcher said, “the problem with socialism is that you eventually run out of other people’s money. And that is where Venezuela is. An oil rich and previously prosperous economy turns to socialism and has now totally run out of money”. And the effect on the economy is totally disastrous. GDP is down over 40% in the last 3 years. Just in 2018, GDP is expected to be down 18%. The economic hardship is so severe that many people have no money and very little food. Poverty was 87% in 2017 and 4 million Venezuelans have left the country since 2016. But when it comes to seeing the effects of printing worthless pieces of paper and calling it money, there is no better measuring stick than gold. Because gold reveals deceitful governments attempts at hiding the truth from the people. A Venezuelan who had bought 6 oz of gold for 900 Bolivars ($1,800) in 1998 would today be a Bolivar billionaire. And this is at the official exchange rate. The black market rate is many times higher. 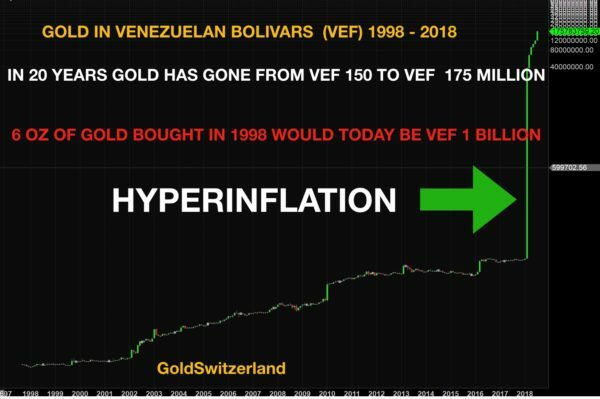 As the chart shows, the exponential move up of gold in Bolivars and the spike in hyperinflation started in 2018. Although Venezuela is the only country currently in the Weimar league, many are on their way. Just look at Argentina and Turkey below with 12,000% and 10,000% inflation rate, measured in gold. The chart of gold in Venezuelan Bolivars above is very typical for a hyperinflationary pattern. It starts at a relatively slow pace and then totally explodes like in Venezuela in 2018. And thus inflation this year will be 1 million percent instead of the expected 2,400%. With debt bubbles in the US, Europe, China, Japan and Emerging Markets, the world is likely to drown in printed money in the next 2-5 years. At that point gold could easily be 175 million Dollars, Euros or Yen. That level is of course meaningless in real terms. But what is very meaningful is that gold will at least maintain purchasing power and more importantly protect investors form the total wealth destruction that the poor Venezuelans are now experiencing. Just like most Venezuelans wish they had bought a bit of gold some time ago, so will most people in the West and the East in the next few years.